“Ok, dudes – time to get your shoes on!” We needed to get out the door in the next ten minutes. I try hard to be intentional in my parenting, so when I told them to get their shoes on, I made sure I had their attention, and that they heard and understood what I needed them to do. I did everything that the “experts” tell you to do to get your children to listen. I knew the boys were engrossed in Pokemon something or another, so I joined them in the living room. I‘m not sure I’ll ever understand what they do with those cards, but they are entertained for hours. Card negotiations were intense as if they were negotiating a multi-billion dollar transatlantic trade deal. I still can’t get enough of how lucky I am that they enjoy one another’s company. So, as I tapped my youngest on the shoulder, I was grinning like a Cheshire Cat. When he looked up – I asked if they were trading cards. I got an enthusiastic response from both of them about Sandslash, Gyarados, and others. Satisfied that I had their attention, I let them know it was time to get their shoes on. Then I ducked back into the kitchen. There it was, instant frustration. I could feel my face getting hot with anger. Have you ever felt like the old, broken record nobody listens to? Feeling ignored has always been a trigger for me. But, before I had children, I had no idea it was a trigger. Before kids, it was easier to place blame elsewhere whenever I yelled. For me, feeling ignored triggers the ultimate human fear – I am not worthy of love or acceptance. I am not worthy of being heard. That’s a dark place to live your life. And when we are afraid and in a dark place, we come out swinging. Or at least yelling. 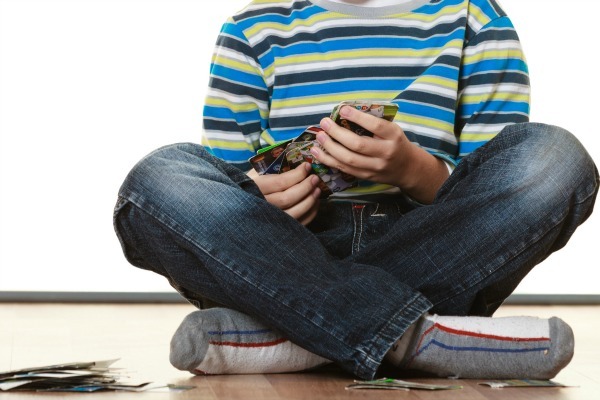 Unfortunately, sometimes we yell at the most precious of our worldly gifts – our children. Even when we don’t want to. Even when somewhere down inside, we know it isn’t anything they’ve done. So feeling ignored has always triggered my anger. And that’s not likely to change in my lifetime. But in adult situations, it was easier to ignore it or to direct the blame onto somebody else. Now that I’m a mother, I know two things. First, it’s ok for me to be angry. It’s inevitable that certain situations will trigger my anger – it happens to all of us. Second, yelling at my children because something has triggered my anger has to change. And now, here’s the thing nobody ever talks about once you become a parent. Nobody ever told me and I was shocked when it happened. As you’re reading this – are you wondering where this trigger of mine came from? You’ve probably guessed it already – I never felt heard, important, or listened to as a child. 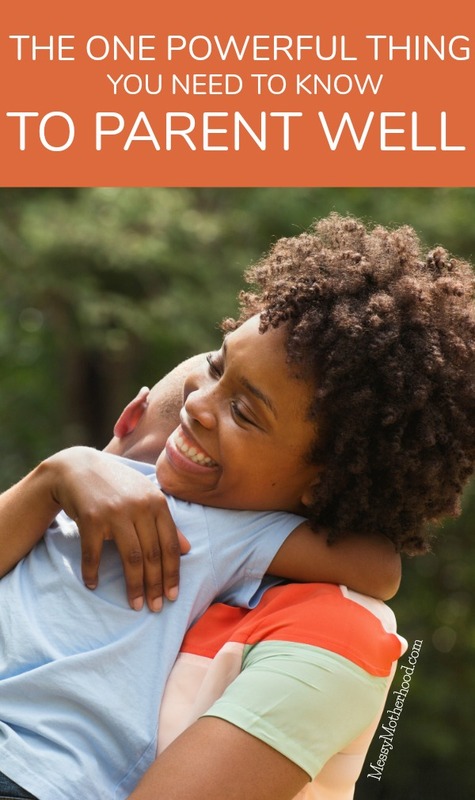 Once you become a parent, it is impossible not to come face to face with the reality of how you were parented – the good, the bad, and the ugly. And for me, this was a frightening experience. I grew up believing I was raised by June and Ward Cleaver. Once I became a parent and examined much of my childhood, it was a shock to realize that the Cleavers may as well have been Martians in my childhood home. There was some messed up stuff I didn’t want to pass on to my children. It is ever-present in the day to day trenches of parenting – whether you know it’s there or not. And it impacts every interaction you have with your child. How you were parented influences all that you are as a parent and underlies each decision you make – the big and the small. And for some reason – nobody ever tells you that you will come nose to nose with personal demons you had packed neatly away, out of sight, so that nobody else would ever know they were there. So gaining this awareness of how you were parented and how it compares to the way you want to parent can be overwhelming. But here’s the great news – that awareness is such a gift. And this can be the gift that transforms you into the parent you’ve always wanted to be! You need only tap into the power it holds. Every single day, I make parenting decisions. Some are more complicated than others, but I try to always be intentional with my choices. Being intentional requires that I am aware of why I respond in a particular way. And knowing why I respond in a particular way allows me to predict when I will respond that way again. And that prediction allows me to learn skills so I can respond differently. So here’s the thing nobody tells you. In order to become aware of why we make the choices we do for our families, we need to recognize that those decisions are grounded in our unique childhood and the way our parents parented us. Yes – in a nutshell – it’s time to recognize and deal with your past baggage. Nose. To. Nose. And here’s even better news, once you’re prepared to do that, there’s help from somebody who knows her stuff. You can start right here and right now if you want a calmer, happier home with your family. 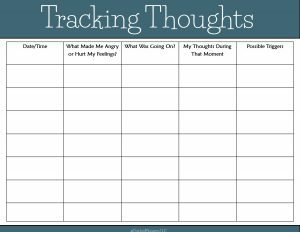 Download this free Tracking Thoughts Handout to help you discover your own triggers that might be influencing how you parent.